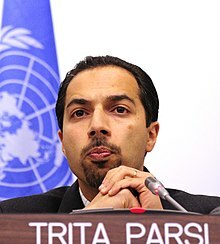 Trita Parsi (Persian: تریتا پارسی‎, born 21 July 1974) is the founder and current president of the National Iranian American Council, author of Treacherous Alliance and A Single Roll of the Dice. He regularly writes articles and appears on TV to comment on foreign policy. Born in Iran, Parsi moved with his family to Sweden at the age of four in order to escape the political repression in Iran. Parsi earned a master's degree in International Relations at Uppsala University and a second master's degree in Economics at Stockholm School of Economics. As an adult, Parsi moved to the United States and studied foreign policy at the Johns Hopkins School for Advanced International Studies, where he received his Ph.D. in International Relations under Francis Fukuyama. Early in his career Parsi worked for the Swedish Permanent Mission to the United Nations in New York, where he served in the Security Council, handling the affairs of Afghanistan, Iraq, Tajikistan, and Western Sahara, and on the General Assembly's Third Committee, addressing human rights in Iran, Afghanistan, Myanmar and Iraq. He has served as an adjunct professor of International Relations at Johns Hopkins University SAIS, an adjunct scholar at the Middle East Institute and as a Policy Fellow at the Woodrow Wilson International Center for Scholars in Washington DC. Parsi is an Iranian-Swedish dual national and a permanent resident of the United States. He is fluent in Persian, English, and Swedish. Trita Parsi was awarded the 2016 Alumni of the Year prize from Uppsala University. Through NIAC, Parsi supports engagement between the US and Iran in belief that it "would enhance our [U.S.] national security by helping to stabilize the Middle East and bolster the moderates in Iran." In a 2011 talk sponsored by the Institute for Global Law and Policy at Harvard Law School, Parsi argued that the conflict between Israel and Iran was not ideological but strategic and geopolitical. In a 2012 article for Salon, Parsi accuses Israel of using "the threat of war to push the U.S. and EU into passing economic sanctions on Iran" and denounced those sanctions as "blind" and "indiscriminate." In 2007, Arizona-based Iranian-American journalist Hassan Daioleslam began publicly asserting that NIAC was lobbying on behalf of the Islamic Republic of Iran. In response, Parsi sued him for defamation. As a result of the lawsuit, many internal documents were released, which Washington Times national security correspondent Eli Lake stated "raise questions about whether the organization is using that influence to lobby for policies favorable to Iran in violation of federal law." The documents included e-mail correspondence between Parsi and Mohammad Javad Zarif, then Iran's ambassador to the United Nations. E-mail correspondence of Daioleslam said, "I strongly believe that Trita Parsi is the weakest part of the Iranian web because he is related to Siamak Namazi and Bob Ney... I believe that destroying him will be the start of attacking the whole web. This is an integral part of any attack on Clinton or Obama." In September 2012, a U.S. federal judge John D. Bates threw out the libel suit against Daioleslam on the grounds that "NIAC and Parsi had failed to show evidence of actual malice, either that Daioeslam acted with knowledge the allegations he made were false or with reckless disregard about their accuracy." Bates also wrote, "Nothing in this opinion should be construed as a finding that defendant’s articles were true. Defendant did not move for summary judgment on that ground, and it has not been addressed here." In 2007, Yale University Press published Treacherous Alliance: The Secret Dealings of Israel, Iran, and the United States. Parsi's work is an expansion of his 2006 Ph.D. dissertation written at Johns Hopkins University under the supervision of his Ph.D. adviser Francis Fukuyama. The book "takes a closer look at the complicated triangular relations between Israel, Iran, and the United States that continue to shape the future of the Middle East." The book argues that the struggle between Israel and Iran is not ideological but strategic. The book received many positive reviews. In Foreign Affairs, L. Carl Brown called the book a "well-constructed history" and former U.S. ambassador Peter Galbraith praised the book as "a wonderfully informative account." The book was also praised by political scientist John Mearsheimer and former National Security Advisor Zbigniew Brzezinski who was on his dissertation committee. In 2008, Treacherous Alliance was awarded the silver medal (runner-up) in the Council on Foreign Relations' Arthur Ross Book Award. Reviewing the book in Commentary in March 2008, however, Nathan Thrall found it "troubling" that a "litany of praise" had "been heaped on this book by authorities in American foreign policy and Middle East studies." Parsi, noted Thrall, believes that "the internal dynamics of states (i.e., their ideology, system of governance, ethnic makeup, class structure, and religion), while important, 'have little or no impact on their respective foreign policies.'" Thrall suggested that in propounding such a thesis, Parsi, "the head of a lobby promoting 'greater understanding' of Iran," may just be "doing his job. But the distinction between arriving at a conclusion and beginning with one is what separates the work of a historian from that of a lobbyist. In this case, it is a distinction that seems to be lost not only on him but on the luminaries who have lined up to endorse his defective scholarship and tendentious conclusions." Treacherous Alliance received the 2010 Grawemeyer Award from the University of Louisville, given for "Ideas Improving World Order." Treacherous Alliance also won the 2008 Arthur Ross Silver Medallion from the Council on Foreign Relations, which described it as a "unique and important book" that "takes a closer look at the complicated triangular relations between Israel, Iran, and the United States that continue to shape the future of the Middle East." In a 2011 interview with the Institute for Global Law and Policy at Harvard University, Parsi asserted that his thesis had "been vindicated" by recent events. "I believe it is increasingly clear that efforts to divide the region between moderates vs radicals, democracies vs non-democracies etc is of little utility and has no real explanatory value. Israel, for instance, who had sought to frame its rivalry with Iran as a struggle between the region's sole Western democracy against a fanatical Islamic tyranny, favored the status quo in Egypt and opposed the efforts to oust Mubarak." He added that "With the decline of the US, Israel's strategic paralysis and increased isolation in the region, the rise of Turkey, the 'revolutions' in Tunisia and Egypt, and Iran's continued difficulties in translating its strength to regional acceptance, the region is experiencing momentous changes both in its political structure and in its balance of power. An ideology based approach towards understanding these shifts won't get you far." In the 2012 book, Parsi's thesis is that US-Iran relations are in a stalemate caused by institutionalized enmity: "The thirty-year old US-Iran enmity is no longer a phenomenon; it is an institution." He argues that the way forth is through sustained diplomacy that he considers "the only policy that remains largely unexplored and that has a likelihood of achieving results amounting to more than kicking the can down the road." Julian Borger wrote in The Guardian that A Single Roll of the Dice is "A carefully balanced and thoroughly researched account of the tortured US-Iranian relationship in recent years." L. Carl Brown from Foreign Affairs said the book is "the most incisive account available... eminently readable, sometimes gripping." Reviewing the book in The Wall Street Journal, Sohrab Ahmari faults Parsi for failing to "re-examine U.S. policy and its underlying assumptions." Instead, he writes, "Quick to ascribe irrationality and bad faith to opponents of engagement, Mr. Parsi is charitable when it comes to examining the motivations of the Iranian side." In opposition to Parsi's position, Ahmari concludes, "Mr. Obama's engagement policy failed not because of Israeli connivance or because the administration did not try hard enough. The policy failed because the Iranian regime, when confronted by its own people or by outsiders, has only one way of responding: with a truncheon." A Single Roll of the Dice: Obama's Diplomacy with Iran was selected by Foreign Affairs as the Best Book of 2012 on the Middle East. This book describe in detail the whole course of the extraordinarily complex international negotiation that led to the conclusion in Vienna on July 14, 2015. Parsi has been a guest on The Colbert Report and The Daily Show with Jon Stewart. Parsi also gave a widely viewed Ted Talk on the possibility of peace between Iran and Israel. In the talk, Parsi "shows how an unlikely strategic alliance in the past [between Iran and Israel] could mean peace in the future for these two feuding countries." Parsi is a frequent guest on news programs including CNN, PBS Newshour, NPR, BBC, and Al Jazeera. Parsi married to Amina Semlali, of Swedish and Moroccan origin, who is a human development specialist at the World Bank. ^ "Trita Parsi". New York State Writers Institute. ^ a b c d e Huffington Post. "Trita Parsi bio". The Huffington Post. Retrieved 25 June 2013. ^ a b c NIAC Staff (8 July 2007). "Dr. Trita Parsi, President". Retrieved 3 March 2011. ^ a b Parsi, Trita. "About Me". Retrieved 25 June 2013. ^ Parsi, Trita (12 November 2013). "Iran Nuke Negotiations - Trita Parsi Interview" (Video). The Colbert Report. 3 minutes, 22 seconds. Retrieved 8 August 2016. I was born in Iran. I am a Swedish citizen ... I'm a [U.S.] green card holder. ^ "Trita Parsi blir Årets alumn 2016 - Uppsala universitet". www.uu.se (in Swedish). Retrieved 2017-03-29. ^ National Iranian American Council (NIAC). "About NIAC". ^ NIAC Staff (1 May 2002). "National Iranian American Council Opens Its Doors". ^ Wong, Joanne. "President of the National Iranian American Council puts the conflict between Israel and Iran in historical perspective". Harvard Law. Retrieved 26 June 2013. ^ Parsi, Trita. "Israel's diplomatic scare game". Salon. Retrieved 26 June 2013. ^ Eli Lake (13 November 2009). "Iran advocacy group said to skirt lobby rules". The Washington Times. ^ Josh Rogin (13 November 2009). "Does Washington have an Iran Lobby?". Foreign Policy. Retrieved 2 February 2014. ^ MJ Rosenberg (7 May 2013). "Epic fail: The neocon attempt to destroy the anit-Iran war movement". Al-Jazeera. Retrieved 2 February 2014. ^ Josh Gerstein (13 September 2012). "Iranian-American group, leader lose libel case against writer". Politico. Retrieved 13 September 2012. ^ Parsi, Trita (28 October 2008). Treacherous Alliance: The Secret Dealings of Israel, Iran, and the United States (1 ed.). Yale University Press. p. 18. ISBN 0300143117. ^ a b "Paul Collier's Bottom Billion Wins CFR's 2008 Arthur Ross Book Award". Council on Foreign Relations. 16 May 2008. Retrieved 25 November 2009. ^ a b Thrall, Nathan (March 2008). "Persian Aversion". Commentary Magazine. ^ Council on Foreign Relations. "Paul Collier's Bottom Billion Wins CFR's 2008 Arthur Ross Book Award". Retrieved 27 June 2013. ^ Saberi, Hengameh. "Interview with Parsi". Harvard. Retrieved 27 June 2013. ^ Steve Coll, 'Will Iran Get That Bomb? ', review of Parsi in New York Review of Books, May 24, 2012, pp.34-36, p.35. ^ Julian Borger (21 March 2012). "A Single Roll of the Dice, by Trita Parsi review". The Guardian. Retrieved 2 February 2014. ^ L. Carl Brown (May–June 2012). "A Single Roll of the Dice, Obama's Diplomacy with Iran". Foreign Affairs. Retrieved 2 February 2014. ^ "It Takes Two to Engage". The Wall Street Journal. 23 January 2012. Retrieved 13 September 2012. ^ "Iran Nuke Negotiations - Trita Parsi". The Colbert Report. Comedy Central. Retrieved 8 August 2016. ^ "Trita Parsi Interview". The Daily Show with Jon Stewart. Comedy Central. 8 March 2012. Retrieved 8 August 2016. ^ "Iran and Israel: Peace is Possible". TED. Ted Talk. Retrieved 8 August 2016. ^ Parsi, Trita. "About Me". Trita Parsi. Retrieved 8 August 2016. ^ "Amina Semlali". World Bank. This page was last edited on 22 March 2019, at 07:55 (UTC).